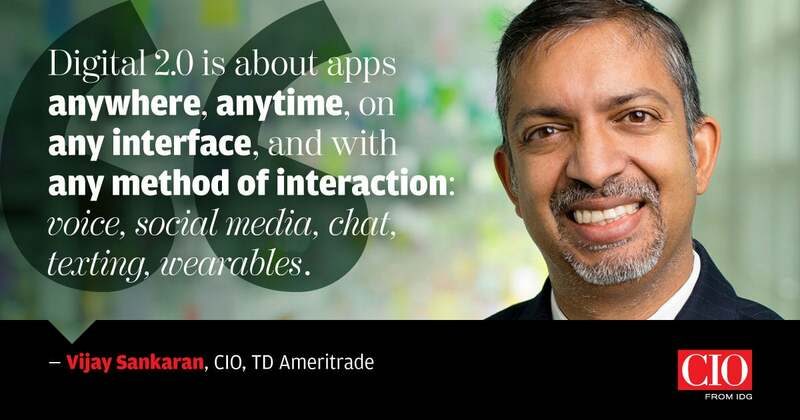 Digital 1.0 vs. Digital 2.0 -- Vijay Sankaran, CIO of TD Ameritrade, explains the differences and offers advice to CIOs looking to move their companies to an “anywhere, anytime, any platform” mindset. In this interview, Sankaran differentiates Digital 1.0 from 2.0 and offers advice to CIOs looking to move their companies to an “anywhere, anytime, any platform” mindset. 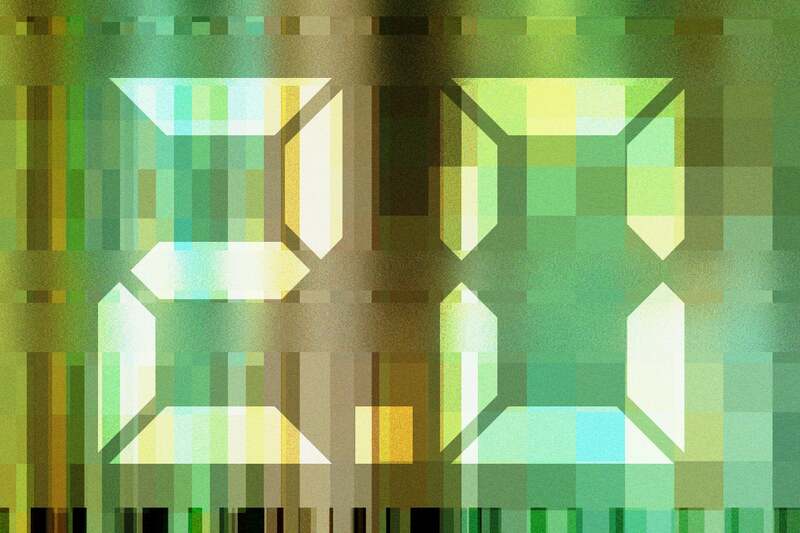 What is the difference between Digital 1.0 and Digital 2.0? Digital 1.0 was all about mobile, simplified design and new kinds of applications. And Digital 2.0 is about apps anywhere, anytime, on any interface, and with any method of interaction: voice, social media, chat, texting, wearables, and even when you are sitting in your car. Digital 1.0 is the services ecosystem powering our mobile apps; Digital 2.0 extends that ecosystem to every next-gen interface that we are seeing across the planet. The Digital 2.0 mindset focuses on customer demand. Our customers want to be able to access any information and get support for anything — whether that involves trading, account information, or tax statements. Maybe you’re up in the middle of the night and you want some account information. You say, “Alexa, ask TD Ameritrade what my unrealized gain was on Apple stock was for last six months,” and you get what you need. You do not worry about when a business is “open.” That’s the Digital 2.0 mindset. What are some examples of Digital 2.0 that you have initiated at TD Ameritrade? We currently have three specific examples of Digital 2.0 in the marketplace: The first is an app that we built in Facebook messenger that allows our customers to use a chat interface to log into TD Ameritrade, get market information, place trades, look up balances, and access educational videos. We’ve also extended that capability out to Twitter where customers can direct message TD Ameritrade to perform those same functions. And finally, there is Apple Business Chat. We were among the first businesses to give customers the ability to use iMessage to interact with a commercial business. We also have a skill for Amazon Alexa where customers can get market information and education, and we are currently building the ability to authenticate using voice-based interfaces. We are also developing a voice-based app for our internal associates, which will give them access to a wealth of information. All of these capabilities are powered by an artificial intelligence (AI) backend that has a repository of content for education and Q&A. The experience is augmented by human support. It is built to detect when a customer’s need is not being met by the AI engine and will seamlessly transfer them to a live chat agent. What foundational work did you do to enable Digital 2.0 innovation? Our investment in a modern services layer has been critical to our ability to innovate in 2.0, since we power those 2.0 interfaces with the same services layer that we use for all of our mobile and web platforms. Getting that services layer right was key. And then culturally, we’ve built a test and learn approach here. We’ve also put together a tiger team, which includes a cross-functional group of progressive thinkers from technology, product, user experience, and design. We also have people from risk, compliance, and security on the team, so that when we launch a new experience, we have looked at it from all sides. If the tiger team has been tasked with “innovation,” how do you make innovation a part of the broader cultural fabric of the company? Companies that want to be innovative have to think about innovation holistically. Our emerging interface experience team is thinking about the external market, but we are also fostering internal innovation within with the rest of our employee base. For the last three years, we’ve held a firm-wide innovation contest called the “thinkoffs,” along with internal hackathons focused on blockchain, artificial intelligence, and augmented reality. Sometimes, employees want to innovate, but they don’t know what an innovation is or how to structure it. We’ve spent the last few months looking at how to do large-scale innovation, and we are formalizing a process for teaching our 10,000 associates how to innovate and bring their ideas forward. Our approach to innovation, then, has three prongs: 1) taking our existing services platforms and extending them out to new interfaces through partnerships, 2) incubating new business ideas, and 3) inspiring and teaching our entire employee base to innovate collectively. Those are the three legs of our innovation stool. What advice do you have for CIOs who need to get their businesses to think 2.0? Business executives can have a hard time thinking beyond the technology to seeing the whole picture. So, you have to be very proactive and show them what’s going on with other companies, give them examples, build out demo apps, and get them excited. It’s all about articulating the value proposition very clearly and then connecting the dots for them as to what your technology organization has to do to support that level of change. I am a big fan of the magnet theory: when creating something becomes a magnet for more innovation. When we first introduced agile, for example, we took a few key teams and cordoned them off to experiment with the methodology. When they produced some quick wins, other business leaders were impressed and said, “I want us to be more like them. I don’t want to wait 30 days for my technology solution.” We started with two teams, expanded to 10, now we do 70 percent of our development in Agile. That’s how a transformation takes hold. Vijay Sankaran is CIO for TD Ameritrade, a position he’s held since January 2016. Prior to that, he was managing director of advanced technology, analytics and architecture with the firm. Before joining TD Ameritrade, he was with Ford Motor Company for several years. Sankaran holds a BS in mathematics and computer science from MIT and an MBA from Duke University Fuqua School of Business.